Through April, Ford has sold 43,000 Fiestas in Europe. Ford of Europe hopes that new scrapping incentives in the U.K. will help end the automaker's sales slump in its No. 1 European market and turn around its overall sales in the region. The reason the automaker is positive is because similar subsidies increased Ford's April sales by 19 percent of more in Germany and Italy. "Our improving trend makes me cautiously optimistic that our sales will be enhanced further once the newly announced scrappage initiative in the UK gets fully underway in the coming months," said Ingvar Sviggum, Ford of Europe's head of sales of marketing said in a statement today. Ford's U.K. sales fell 12.9 percent to 28,300 new cars in April. In the first four months the automaker's U.K. sales are down 23.3 percent to 125,800 vehicles. Ford is expecting a better results once the U.K. government's scrapping scheme starts later this month. The U.K. is giving motorists a 2,000 pound (about $3,000) discount on a new car when they trade in a car that is more than 10 years old. In Germany, people who scrap cars that are at least 9 years old and replace them with new vehicles get a 2,500 euro bonus. The subsidy helped increase Ford's April sales 19.6 percent to 27,700 units. Overall, the German market was up 19.4 percent last month to nearly 380,000 units. Thanks in part to a scrapping subsidy of up to 5,000 euros, Ford's April sales in Italy were up 28.7 percent to 20,800 units. Despite increased volumes in those key markets, Ford's overall April sales were down 7.4 percent to 120,000 in its 19-country market for western and central Europe. Its four-months results were off 14.4 percent to 471,700 units, the company said. Many customers in countries with scrappage incentives are trading in their old, large models for smaller, more fuel-efficient cars. 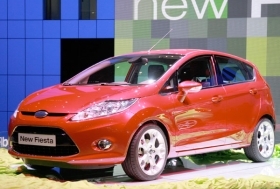 This trend has benefited Ford's recently launched new-generation subcompact. "More and more customers are changing to Ford because of our extremely strong product portfolio, including the new Fiesta which -- despite the weakness in the overall European new car market -- is our fastest-selling Fiesta ever," Sviggum said. Through four months, Ford has sold 43,000 Fiesta in its 19 main European markets.